Scuba diving in Raja Ampat - where, how, liveaboard or shore? 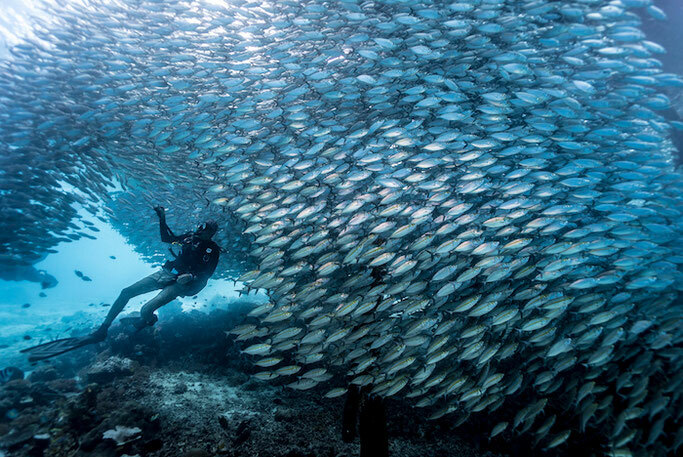 Raja Ampat in Indonesia is scuba diving heaven. There's no place quite like it for scuba divers and is top on most divers bucket list! However, it is notoriously expensive and hard to get to, so when doing it it's got to be done properly! That's why Girls that Scuba is here to let you know everything you need to know before visiting Raja Ampat! 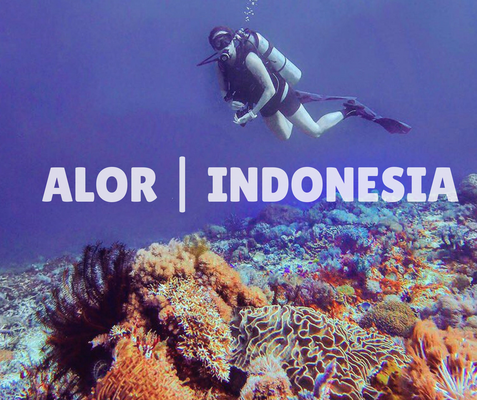 Let's start with the reason you are here; to see what the scuba diving is like in Raja. You've heard it's one of the best dive destinations in the world, but is it? Well, do you like warm waters, manta rays, sharks, macro, huge schools of fish, drift dives and pretty much everything in between? Then Raja Ampat is the place for you! It has pretty much everything a recreational diver could ever want. A great first dive for your Raja Ampat adventure. Consisting of a coral column that plunges down to 25 meters deep. Perfect for beginners or those at an intermediate level, in light of its currents, which are usually light but can occasionally be rather strong. As a rule you can expect is to see many yellow snappers on the reef and, if you dive down a little farther, you can find Wobbegong sharks. There are also seahorses, fusiliers, trevallies, groupers, giant clams, morays and much more. One of the more famous of the Raja Ampat Dive and is often dived with Mioskon as the 2nd dive. An underwater pinnacle that starts around 7 meters and goes down to less than 30 meters. You can expect to find all sorts of different fish species and several cleaning stations, big schools of fish and larger predator fish, sharks and manta rays in season are also common sittings. Pygmy Seahorse are also abundant on this Central Raja Ampat dive site. Looking for somewhere cheaper to dive? Check out our list of cheapest to most expensive countries to get certified in. The site is a very large underwater pinnacle, which is oval in shape and about 200m long, with a reef top at around 5m and gently sloping sides down to the flat sandy seabed at about 25m. The current “splits” there and flows both down the northern and southern flanks of the pinnacle and over the top along the reef top. You can expect to see large schools of fusiliers, sardines, damsels, banner fish, butterfly fish, sweetlips and snappers frequent the site, triggerfish and predators such as barracuda, Spanish mackerel, Jacks and giant trevallies can be seen as well. Then there is the black tipped reef sharks, white tipped reef sharks and even grey reef sharks. Searching for the wobbegong shark? Here's where you will find it! Located in the Jet Fam Islands, a group of islets and limestone islands on the west side of Batanta Island which is considered to be among the best diving spots in Raja Ampat and the place to see the strange and impressive wobbegong as well as manta ray’s, great barracuda’s and maroon clownfish hiding inside the anemones. 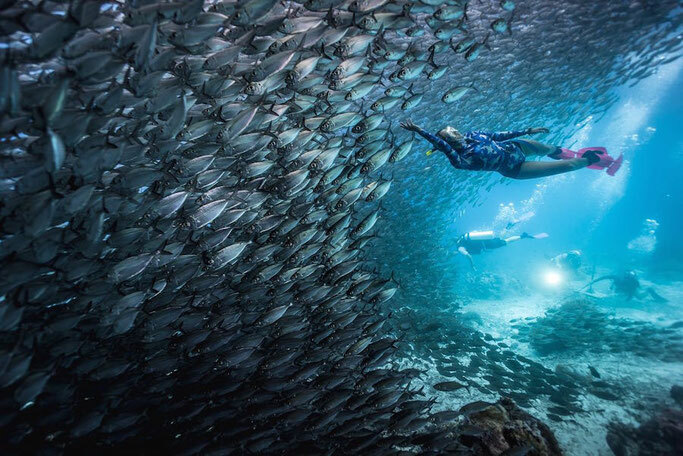 This is the one dive spot you absolutely can't miss. A narrow channel runs between the Keruo channel with towering sheer cliffs up each side. The dive site runs along the western wall of the channel, and can be either started from the north or the south depending on which way the current is flowing. 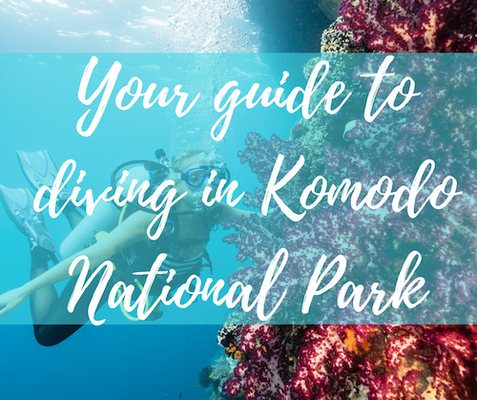 The dive site is a spectacular wall covered in colourful sponges and nudibranchs. The bottom is at 35m but stay at 25m and drift along with the mild current as the tender follows you from above. This is another site that ends with a sheltered shallow reef that is great for some reflection photos with the trickling lighting. Cape Kri holds the world record for the site with the largest number of species referenced in one single dive! The crossroads of different currents at the tip of the island of Kri has created an incredible variety of fauna and flora – all kinds of sharks, many schools of fish, amazing coral diversity, specimens for macro fans…everything is there! Sometimes, it’s enough to just dive down, cling to a rock, and enjoy the show! You never ever return disappointed from a dive at Cape Kri!! The famous Arborek jetty, where thousands, if not millions of fish surround your every move. Where your site is stolen by schools, and your skin is touched by magic. There is truly nowhere else like this in the world, and we actually recommend freediving here rather than diving. The jetty itself starts at around 2m and goes down to around 10, so freediving and snorkelling actually gives you a better experience. You cannot come to Raja Ampat and not come to Arborek jetty. A lot of divers who make it all the way out to Raja Ampat prefer to then jump straight on a liveaboard (a boat you live and dive on for the duration of your stay) and get as many dives as possible - and do you blame them? A liveaboard in Raja Ampat may just be one of the best things you'll ever do, but they are a little bit (a lot) pricey. 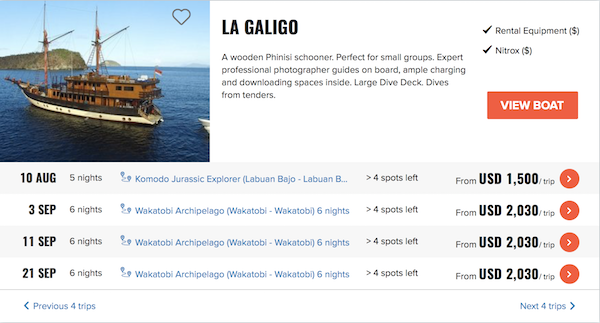 So first, weigh up if you can afford it - if the answer is yes then without a doubt you should be checking out the best liveaboards in Raja Ampat right now and booking yourself a seat! On our trip to Raja Ampat, we actually stayed in a resort and dove every day from their boat or from the shore of the island. This worked out a hell of a lot cheaper and we still managed to do plenty of dives, however, there were a few long boat rides and a few missed diving spots. We stayed with Raja Ampat Dive Resort who offer a dive and stay packages - like most resorts on the islands. Our recommendation? If you have the money, go for a liveaboard, however, you can still get a lot of diving in - on a budget by staying in a resort, check out these 4 diving resorts in Raja Ampat below. Possibly one of the most beautiful places on earth Raja Ampat on land is not to be missed (after all you've at least got your non-dive day). 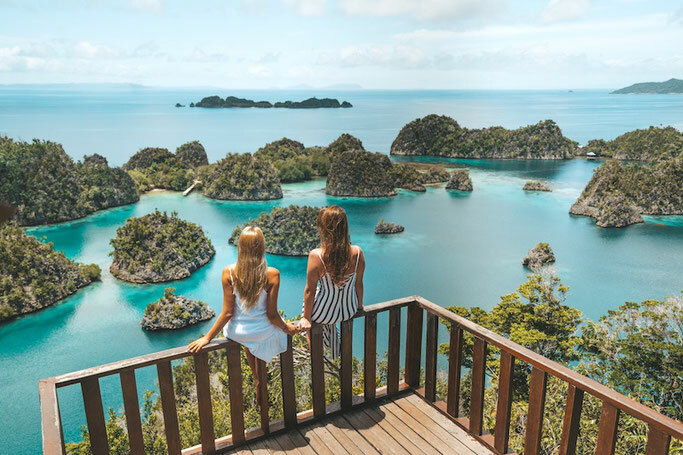 The most popular thing to do in Raja Ampat is Pianemo lookout point. To get to Pianemo you can actually combine in one of your dive days and it is only accessible by boat - make sure you ask your dive operator to take you there. With a population of only 197 the village of Arborek is fast rising as a pioneer among the 18 beautiful villages in West Papua that have embarked on developing local regulations for community-based marine conservation. Home to the Arborek jetty - where the locals proudly protect the fish and the jetty, you would think that is its main attraction, however, we quickly found it was the locals themselves. Walking around the village talking and taking selfies with the islanders was a blast - we even met a lady who was a part of Girls that Scuba on the island - talk about GTS power!! For sure go and visit after you've explored the jetty! Now, this is the tough bit! It's HARD to get to Raja Ampat. And long. BUT, it is worth it, and it separates the real divers to the novice ones. 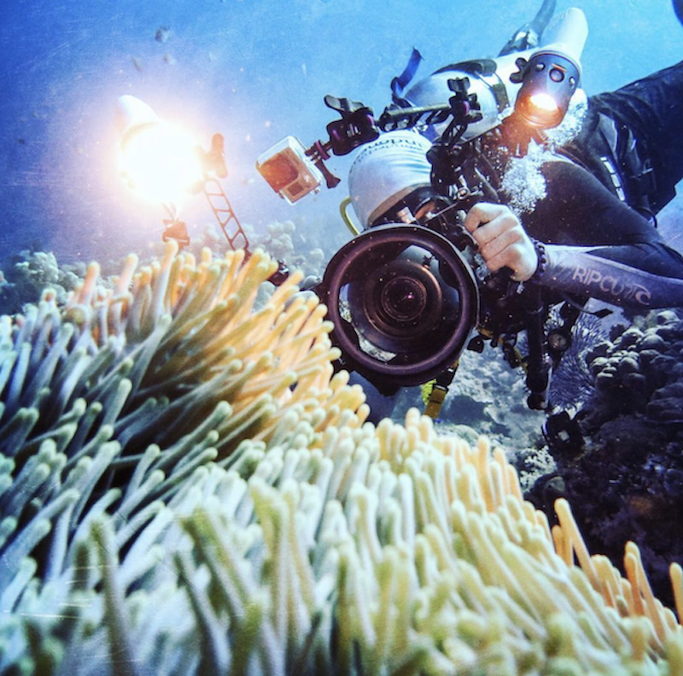 Want to dive Raja Ampat? Well, get ready for quite the journey! Wherever you fly from you have to get into Sorong, the closest Indonesian city in West Papua and the gateway to Raja Ampat. From Sorong you then need to get to Sorong harbor. You can take a taxi from the airport to the harbor which will take about 20 minutes and cost around 100k rupiah. If you don't have much luggage, you can try catching an ojek (Indonesian name for motorbike) for about 20k rupiah. Raja Ampat has four main islands: Misool, Salawati, Batanta, and Waigeo. Waigeo is the main island and the one where most of the guest house and hotels are. 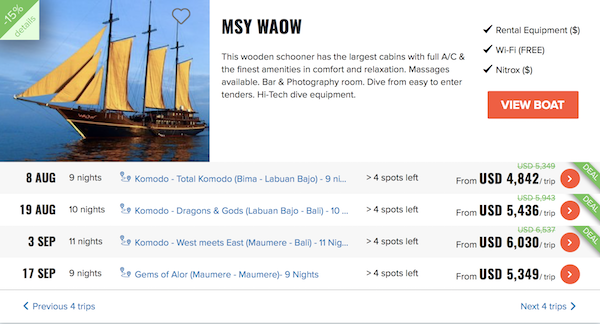 We've spoken a lot about Raja Ampat liveaboards, which is still what we would recommend, but if you are looking to save the pennies it is a lot cheaper to stay in a resort or guest house and dive when you like. 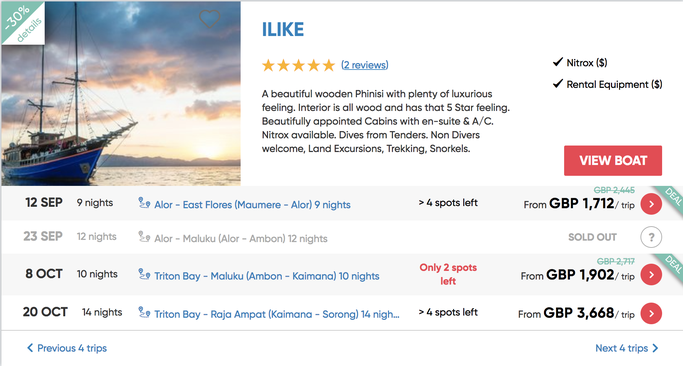 Head back up to "Liveaboard or Shore diving" to check out our recommended resorts, and for guesthouses do a little search in booking.com below. Remember most resorts and guest houses are on Waigeo. Your own equipment is advised. 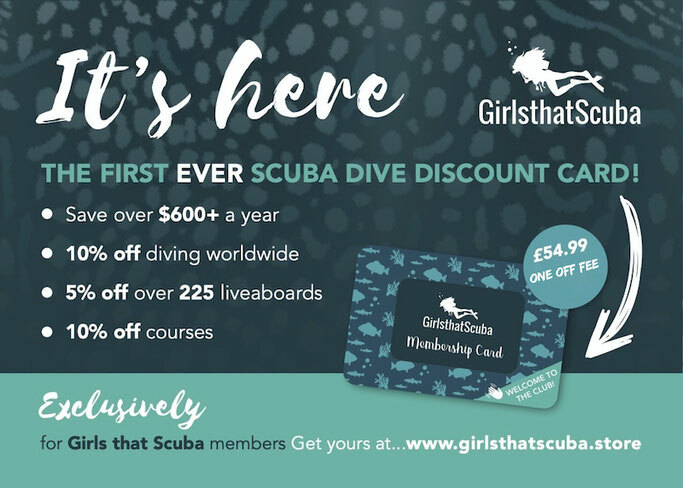 Check out the best female scuba equipment from head to toe here! If you are in Indonesia, your journey to Raja Ampat may only take you a day - and 2 - 4 flights (it took us 4 from Komodo) to most people's standard a pretty long travel day. But, if for instance you are coming from the U.K you will most likely have to fly UK - Dubai (stop over) - Bali - Makasar - Storong taking you 2 days. 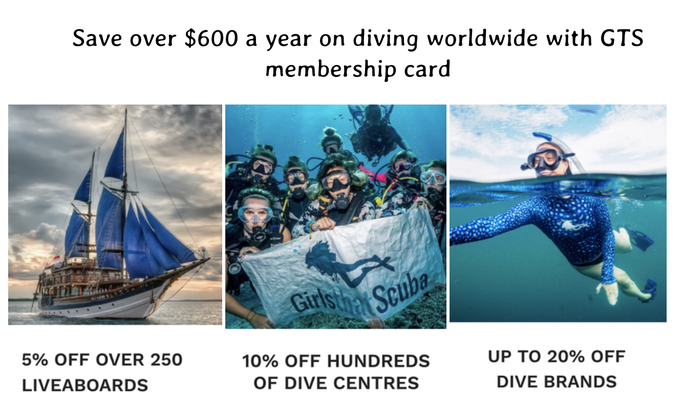 You will also most likely be spending a minimum (if you find a cheap liveaboard deal) of £3,000 for flights and liveaboard and anything up to £10,000 depending on the boat and the season. Here are some examples of prices. So is it worth it? The short answer is YES. However, if you are a new diver and have only been to a few countries to dive in we'd suggest seeing a bit more of the ocean first. Raja is some of the best diving in the world - so what's the rush? It's better if you have something to compare it to. Experienced diver who's had Raja on your scuba bucket list for years? (yes, that was us) then we say YES it is 100% worth the money and time. We'd recommend doing a live aboard for 7 days and then taking a few days after or before to exploring the surrounding areas and rest before an epic flight home!